The difficulty of finding doctors with field experience is hampering international medical intervention to help curb Ebola in West Africa. Fear of contracting the virus and restricted air travel have also slowed the response. During a visit to the three most affected countries that began in Guinea this weekend, the US ambassador to the United Nations, Samantha Power, criticized those countries who promised to send doctors and other aid, but have not yet delivered. More than 240 medical workers have died of Ebola in Guinea, Liberia and Sierra Leone, according to World Health Organization (WHO), while regular commercial flights to the affected countries have dwindled, throttling travel and aid delivery. "We have a lot of people applying. but we are clear that we are taking only experienced staff, not Ebola experience, but experience in the field of crisis or emergencies. It is not an easy job we are facing here," said Anja Wolz, Ebola operations adviser with Médecins Sans Frontières (MSF). "The problem is that we have people applying, but we don't get experienced people. We cannot open more centres because we need experienced people. We don't have the staff," Wolz explained. MSF runs two Ebola treatment centres in Liberia; a 250-bed capacity unit in the capital Monrovia and another in the northern Foya District with 120 beds. It has a total of 1,050 local and international staff - sufficient, it says, for the current operations. Foreign medical teams have so far been confirmed for 30 of the 50 Ebola Treatment Units (ETUs) required for the three Ebola-hit West Africa countries, and just a quarter of the 4,388 beds needed in the treatment centres are available, says WHO. Cuba, the US and the UK are among the countries that have committed troops and medical personnel to West Africa. Aid organizations are also receiving offers of help from individuals. 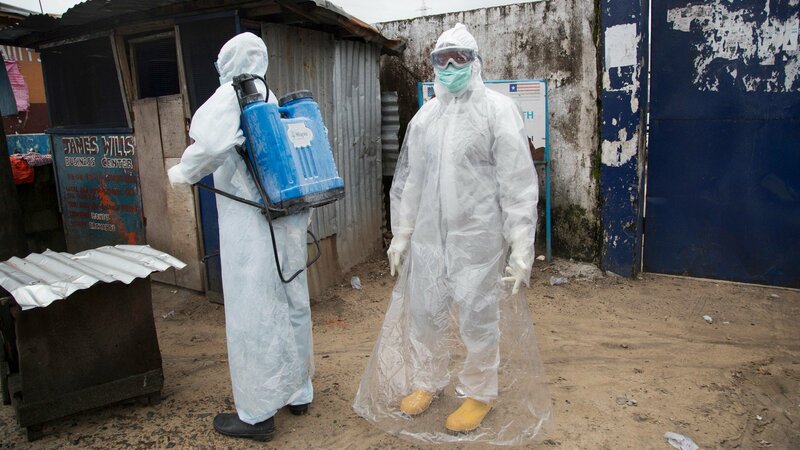 Recently, world leaders made earnest calls for more resources to curb the spread of Ebola, which, according to the WHO tally, had claimed more than 4,900 lives in Guinea, Liberia and Sierra Leone by 25 October. Ebola emergency response programme coordinator with the International Medical Corps (IMC) in Liberia. "With the various training initiatives being launched and INGOs and NGOs joining in. the response has improved," said Cheemalapati. The US is constructing a 25-bed medical unit near Monrovia's international airport to cater for health staff and other aid workers striving to beat back Ebola. The centre is set to open in early November and will be run by some 70 staff. "This is a critical piece. We believe that this will ensure comfort for healthcare workers from around the globe and Liberian national healthcare workers to engage in this fight against Ebola and be able to feel secure that there is a high quality place of care if they were to fall ill with Ebola," Scott Giberson of the US Public Health Service Commissioned Corps told IRIN. Earlier this month, Australian Prime Minister Tony Abbott said his country would not put doctors or nurses in "harm's way" by sending them to West Africa until "all of the risks are being properly managed. At the moment we cannot be confident that that is the case." Currently in Liberia, there are six operational ETUs. Nine are under construction and eight more are planned to be put up across the country where the virus has been more devastating than in its two West African neighbours. In addition to the medical personnel, support staff, especially hygienists, are crucial to the safety of patients and staff. "We need many more infection control people. It's not just the medical staff because when we talk about safe burials, hygiene in the centre, waste management . it is infection control," said Wolz. "Everybody talks about the health staff. Nobody speaks about the hygienists, the ambulance drivers. who are all getting infected and dying." MSF runs a two-day training for doctors coming to help with Ebola control. But even with the training, working in a field hospital in full protective gear trying to contain a highly infectious virus is arduous, and the death rate is emotionally distressing. "You have two pairs of gloves and when you have a hood on, to use a stethoscope is very difficult. It is difficult to do a good examination with all these gloves. You cannot really speak with the patients. Sometimes you cannot stay longer than 40 minutes inside because of the heat. That makes it really difficult," Wolz recounted. "A lot of people also forget how emotional it is. You know your patients. You know their history and you see them dying. You see the father dying, you see the mother dying, the sister dying. It's quite emotional. We save lives, yet you cannot do it. Some people cannot cope with it. You feel so hopeless and frustrated." As more Ebola treatment centres are built, more trained personnel will be needed. WHO is conducting training for health workers at a mock Ebola treatment centre in Liberia. IMC said it has submitted a proposal for the funding of a training programme for organizations that are establishing treatment units. "Organizations will have the opportunity to send staff for a series of didactic, simulated and hands-on sessions that will enable them to establish and implement ETUs," said IMC's Cheemalapati. "Individuals with the proper equipment, training and supervision can safely work with Ebola patients. That said, there is [still] risk and to mitigate that we do our utmost to ensure that the best protocols and practices are followed faithfully," she added. Exportation du virus Ebola : qui est réellement menacé ? Afrique de l'Ouest en quarantaine ?